The History of the Native American Wars including details of the dates locations and summaries. The causes of the Native American Wars, were because of the opening of Native Indian lands to colonization, the conquest of the Native American Indians or the history of forced relocation to Indian reservations. The Native Indian Wars began with the Tiguex War in 1540 against the Spanish and effectively ended with the Ghost Dance War and the Wounded Knee Creek Massacre in 1891. The following fact sheet contains interesting facts and information on Native American Wars. Native American Wars Fact 2: The Tiguex War of 1540 - 1541 was the first war that fought between Europeans and Native Americans. The battles were fought by the Spanish army of Francisco Vasquez de Coronado against the Tiwa tribe of Pueblo Indians in New Mexico. The Tiguex War ended with the surrender of the Tiwa Native Indians and many of the captives were burned at the stake. Native American Wars Fact 3: The French traded for furs in the regions around the Great Lakes and rivalry and competition between the tribes, aiming to establish a fur trading monopoly, led to bitter warfare between many of the tribes. Native American Wars Fact 6: The Powhatan Wars, erupted in Virginia between English colonists and the Powhatan tribe. The series of three wars were fought between 1609 to 1646 and resulted in the defeat of the Powhatan tribe. Native American Wars Fact 10: During the American Revolution (1775- 1783) many Native Indian tribes fought for the British which provoked retaliatory campaigns by the Continental Army such as that of General John Sullivan on the Iroquois of New York. 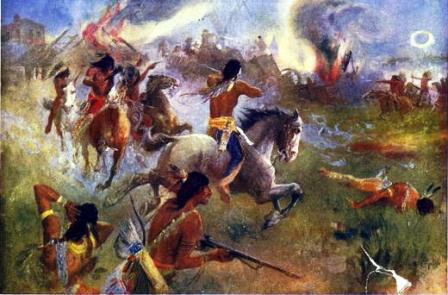 Native American Wars Fact 13: The Northwest Indian War (1785–1795) in Indiana and Ohio led by Little Turtle saw Americans suffer two humiliating defeats by the Native Americans before they won the Battle of Fallen Timbers in 1794. Native American Wars. Discover the key dates, key people and events of the Native American Wars together with the causes and effects of the war, conflict and battle. Pictures have been include wherever possible which show the clothing, weapons and decorations of various Native Indian tribes and their leaders who fought in the Native American Wars. The illustrated text provides a really useful educational resource for kids and children of all ages. We have included pictures and videos to accompany the main topic of this section - The Native American Wars. The videos enable fast access to the images, paintings and pictures together with the information and the many facts featured on this subject of the Native American Wars.